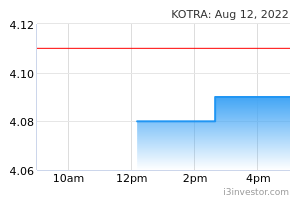 Kotra Industries Bhd is an investment holding company. Along with its subsidiaries, the company is engaged in research and development, manufacturing and trading of pharmaceutical and healthcare products. Its product range includes nutraceutical and pharmaceutical products. It offers tablets, capsules, creams, and ointments under the brand name Appeton, Axcel, and Vaxcel. It operates in Malaysia. Ting Hieng Hock Post removed. Why? birkincollector sudden spike in price and volume, next goreng target? averose 2QFY17 net profit soared more than nine times to RM5.8 mln, from RM591, 000 last year, attributed to higher export sales. 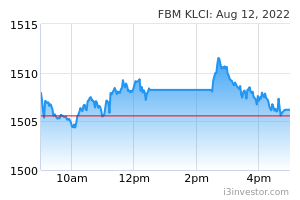 Quarterly revenue also increased 14.6% Y.o.Y to RM45.1 mln, from RM39.3 mln in 2QFY16. bursanewbie Tortoise, do u mind to share how u get ur Tp Rm5? mahorse That is exceptional, please tell more. Justify . Glaceau The Board of Directors of KOTRA wishes to announce that the Board of Directors has resolved to recommend a single tier final dividend of 2 sen net per ordinary share for the financial year ended 30 June 2017, subject to the approval of the shareholders at the forthcoming 18th Annual General Meeting of the Company. The proposed final dividend if approved, the Entitlement Date and Date of Payment will be fixed on 3 January 2018 and 18 January 2018 respectively. This announcement is dated 12 October 2017. BlackWhite Tecpower , ironically our stock market free fall shortly after the big B. ASEAN climbed. BlackWhite Share any article that explains this irony. willc48 Any pharma repack wont go low like this..